Auburn’s gifts were nurtured towards a military direction from an early age, as he confessed to professor Reyl, alluding to a non-canonical education during his apprenticeship in the Citadel. Auburn Thorn was born of Ochrun parents on Accadian soil, while they were serving their tenure as diplomatic attachés of the joint Ochrun Embassy on Accadia. His parents, both of the Ochrun clan of Thorns, were Heron of the Hoarfrost Keep and Lyceene of the Rendstag Keep. In accordance with the laws regarding foreign births, Auburn was given both Accadian and Ochrun citizenship. By his third year of life, six seasons before the end of his parent’s tenure, Auburn was identified as having oracular abilities. His parents cut their terms short and returned to Ocheron and to the Clan’s homeland, so that Auburn could be nurtured and taught by the clan’s Norns. Four years later, under unknown circumstances, Auburn and his parents returned to Accadia, seemingly with the single purpose of Auburn joining the Empyrean Citadel of the Accadian Federation in Atrytone. At the age of 18, his parents departed from Accadia, and made Ocheron their permanent residence. 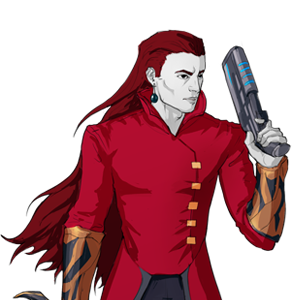 Auburn joined the military branch of the Empyrean Citadel and became a member of the Accadian Armed Forces. After receiving the rank of lieutenant at the age of 26, and despite his minimal relationships with his clan back on Ocheron, the Count of the Clan of Thorns announced Auburn to be the heir and custodian of the Rimehill Manor, and named him a Baron. Auburn suffered a severe backlash from that action, being denied any more advancement within the Accadian Army. His seniority was taken into account though, and he was made a lieutenant 4th Class at the age of 34, even before he had met with professor Reyl. Auburn’s military file shows little to no combat experience up until the age of 26, but remains largely classified after that. His continued progress in seniority as a lieutenant coupled with his wife’s remarks about him going to dangerous secret missions indicates that Auburn spent the eight years leading to his acquaintance with professor Reyl…interestingly. According to professor Reyl’s accounts, Auburn appeared to be a man of remarkable composition and intimidating physique. The series of incidents professor Reyl recounts during his cooperation with Auburn demonstrate him to have been a both battle-hardened and sophisticated individual. At the age of 26 Auburn met Weaver Alcaraz a woman of Bao descent, also an Accadian citizen due to her place of birth. They married two years later and soon had their first child, their daughter, Astrid. Read about Auburn Thorn in Professor Reyl’s accounts of the historic events in Elmwean’s Lodge.